Don’t be surprised if you have family members who gobble up slow-cooked dishes containing ingredients they typically don’t like. The beauty of slow cooking is that it tempts and tantalizes your nose for hours before the food is ready to actually consume. And you increase interest in trying foods when picky eaters help you prepare the dish, so get them in the kitchen to assist with the preparation! Cheaper cuts of meat with connective tissue and lean muscle fibre are suitable for stewing, and tastier than stews using expensive cuts, as long slow cooking will soften the connective tissue without toughening the muscle. Slow cooking leaves the gelatinized tissue in the meat, so that it may be advantageous to start with a richer liquid. Food can be set to slow-cook before leaving for the day, and will be ready on return. Some models include timers or thermostats which bring food to a given temperature, and then lower it. With a timerless cooker it is possible to use an external timer to stop cooking after a set time, or both to start and stop. Cooking the meal in a single pot reduces washing up, and the low cooking temperature and glazed pot make cleaning easy. To make cleanup even easier, spray the pot with non-stick cooking spray before adding ingredients. Some vitamins and other trace nutrients are lost, particularly from vegetables, partially by enzyme action during cooking and partially due to heat degradation. When vegetables are cooked at higher temperatures these enzymes are rapidly denatured and have less time in which to act during cooking. Since slow cookers work at temperatures well below boiling point and do not rapidly denature enzymes, vegetables tend to lose trace nutrients. Blanched vegetables, having been exposed to very hot water, have already had these enzymes rendered largely ineffective, so a blanching or sautéing pre-cook stage will leave more vitamins intact. This is often a smaller nutrient loss than over-boiling and can be lessened to an extent by not removing the lid until the food is done. 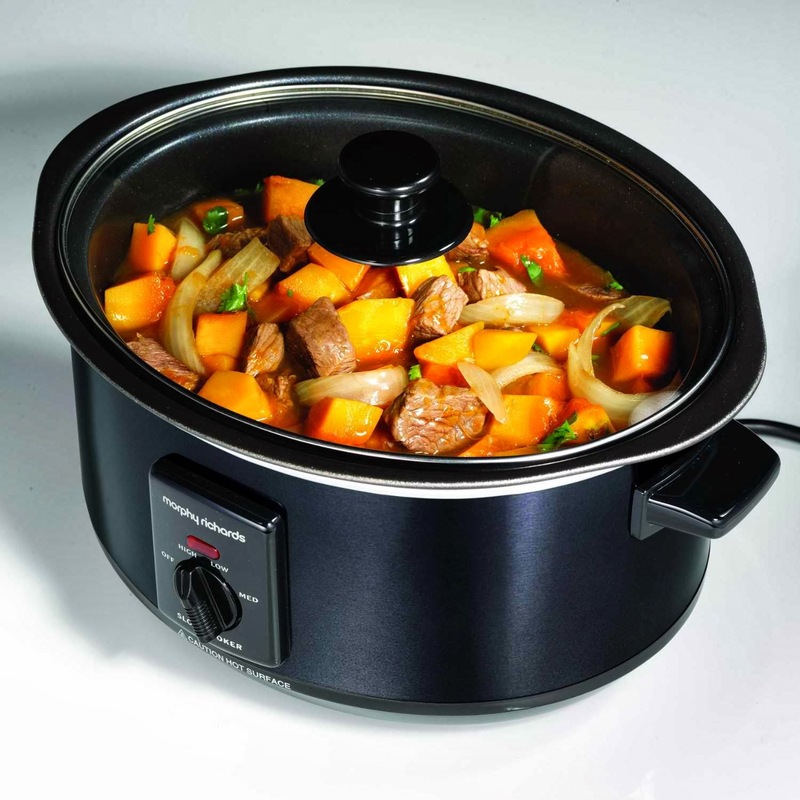 Slow cookers do not provide sufficient heat to compensate for loss of moisture and heat due to frequent removal of the lid, e.g., to add and remove food in perpetual stews, (pot au feu, olla podrida). Added ingredients must be given time to cook before the food can be eaten. If food is allowed to cool below about 70 °C (158 °F) and not reheated, harmful bacterial growth is possible; some bacteria produce toxins or spores which are not destroyed even by reheating. Do you know? How do you Sauté Vegetables and Meats Like a Famous Chef? Raw kidney beans, and to a lesser extent some other beans (such as broad/fava beans), contain the toxin phytohaemagglutinin, which is destroyed by boiling, but not by the lower temperatures of a slow cooker, so dry beans must be boiled at 100 °C/212 °F for 30 minutes prior to slow cooking, or alternatively soaked in water overnight, discarding the water and then boiled for at least 10 minutes. Even a few beans can be toxic, and beans can be as much as five times more toxic if cooked at 80 °C (175 °F) than if eaten raw, so adequate pre-boiling is vital. Cases of poisoning by slow-cooked beans have been published in the UK; poisoning has occurred in the USA but has not been formally reported. This risk can be avoided entirely by using canned cooked beans, adding them towards the end of the recipe's cooking time. 1) Always make sure meats are completely cooked in the slow cooker. That means ground beef, pork, sausage, and recipes containing them, such as meatballs, need to reach 160 degrees. Chicken breasts need to reach 170 degrees. For the most accurate results, use an instant-read thermometer to check the internal temperature at the end of your cooking time. 2) When a time range is given in a recipe, always check the progress at the first or lowest time listed. Then be prepared to extend the cooking time as needed. 3) Fill your slow cooker at least half full, but no more than three-quarters full for the best results. 4) Preparation can be done ahead of time. Just fill the slow cooker insert the night before, cover, and refrigerate. If possible, bring it to room temperature 30 minutes ahead of time. If not, just place in the slow cooker base and cook as directed. You might need to add 30 minutes to the cooking time. Check at the time listed, then add more time if necessary. 5) Because slow cookers prepare food at an even rate and because it’s covered, the food stays moist. Just remember that by cutting foods to a uniform size, you promote cooking at a uniform rate. This is especially important for stews that use lots of vegetables as well as bite-size meats. 6) The slow cooker is much more energy efficient than an oven and is perfectly safe to leave on all day for cooking. It uses extremely low wattage, so go ahead and let it cook while you are asleep or gone for the day. A bonus is that it doesn’t heat up your kitchen like ovens or stoves do. 7) Don’t worry if the recipe seems to not have enough liquid. Since there is little evaporation, it will be fine. The exception for using more liquid will be if you are cooking dry beans, or if pasta or rice is added, which will absorb liquid as it cooks. 8) Most meats benefit from being placed on a bed of vegetables that have been placed on the bottom of the slow cooker or surrounding it. Typically, these vegetables are onions, carrots, mushrooms, or some form of potatoes. You don’t have to serve the vegetables with the meat if you have picky eaters, but they taste terrific and help keep the meat moist. 9) If you don’t use fresh garlic, 1/2 teaspoon of commercially minced garlic is equal to one clove. 10) The lid allows condensation to fall back into the slow cooker, which practically works like a self-baster for the food inside. Most slow cookers have clear lids for peeking at the food bubbling away inside. There is no need to open the lid or to stir thanks to the steady cooking temperature. So resist the urge to lift the lid. If you do, you immediately lower the temperature and thereby increase the cooking time required. For every lifting of the lid, tack on at least an additional 15 minutes of cooking time. Depending on how long you leave the lid off, it may increase the cooking time by up to 30 minutes. 11) The “warm” setting on many slow cookers is a terrific way to keep the food ready to serve if you eat in shifts or if you have late guests. If you don’t have a warm setting on your slow cooker, turn it off and leave it covered. Then 15 minutes before serving, turn the slow cooker back on low. 12) The average temperature of a slow cooker set on low is 200 degrees F and 300 degrees F on high. 13) High settings typically cook foods in half the time of those cooked on the low setting. So if you have a recipe that calls for the food to be cooked on high for 4 hours, it will cook on the low setting in 8 hours. 14) Seafood is often added at the end of slow cooking to preserve the texture. The same is true for some dairy products and fresh herbs. 15) Don’t try to cook frozen meats in the slow cooker. Frozen loose-pack vegetables and fruits are fine, but meats should be thawed first in the refrigerator. 16) For the sake of food safety, don’t try cooking a whole chicken or turkey in the slow cooker. It simply takes too long to get the meat to a safe cooking temperature due to the density of the bones. Stick with poultry pieces instead. 17) Use the slow cooker for cooking purposes only rather than for reheating already cooked leftovers that have been refrigerated. 18) For a richer flavor as well as more color, consider searing large cuts of meat or browning them in a skillet before adding them to the slow cooker. 19) Some slow cookers come with an insulated carrier that makes transporting food from your kitchen to another location a breeze. Rather than just placing the slow cooker in the carrier, I have found that placing a piece of heavy-duty aluminum foil between the lid and the slow-cooker insert top helps enormously. This works to keep road bumps along the way from becoming spills whether you have a carrier or not. If you don’t have a carrier, consider setting the slow cooker inside an insulated cooler. Cushion it with towels to prevent any shifting during driving. 20) I love slow cookers that have elastic bands included for transportation purposes. This band hooks underneath the handle, goes over the lid, and attaches underneath the other handle. It keeps the lid secure with hardly any effort at all. If your slow cooker doesn’t have one, find a large band to fashion your own system. Just test it out before you have the slow cooker warm and full of food. 21) Temperature extremes can cause the ceramic insert of the slow cooker to crack. Never freeze foods in the insert or use it on the stovetop as you would a Dutch oven. With that type of scenario in mind, don’t put cold water in a hot slow-cooker insert. Let it cool at least 30 minutes before soaking it for cleanup. 22) If your slow cooker is an older model and doesn’t have a removable insert, use a hot, soapy sponge to clean the inside since it cannot be immersed in water. Slow-cooker liners make cleanup a snap, particularly for these types of cookers. 23) Regular salt can be substituted in any recipe calling for garlic salt, onion salt, or seasoned salt.